Pool phones not required by law in your state? Not having one will still leave you your residents and your property vulnerable to many life safety issues. Here's what you need to know. Without Googling the answer, do you know if your state requires a pool phone by law? Many states do (but not all of them)- see pool phone laws by state here. Technically if your state does not legally require pool phones, you are considered code compliant whether or not you provide an emergency pool phone within the confines of your public swimming pool. 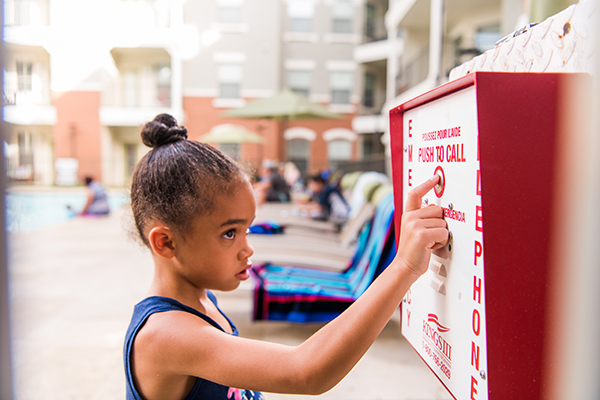 However, as property managers nationwide continue to place significant priority on life safety, they recognize that emergency pool phones can function as an essential life-saving tool year-round, whether required by law or not. Proactive managers look for ways to decrease their risk and liability, and they recognize how emergency pool phones can do so. Emergency departments treat about 6,400 pool and spa injuries in children younger than 15 every year. Drownings continue to be the second-leading cause of preventable death through age 15. In 2016, 780 people age 5 to 24 drowned. Of those, 530 were age 15-24. Some property managers may leave emergencies in their tenants’ hands, expecting them to use their cell phones. They hope that any danger can be reported by a witness directly to a 911 station. Why not, since phones do just about everything else for us these days? If only a situation like that could be that dependable and error-proof. Cell phones can be very inconsistent and unpredictable in coverage and service. Battery life can vary according to the quality and age of the phone. Most importantly, unlike a landline that uses ANI/ALI (automatic number identification/automatic location identification) to identify the location of where a call is originating, cell phones send signals through radio waves in the air. That means your tenants can dial 911 but the Public Safety Answering Point (PSAP) otherwise known as the 911 call center, won’t know from where they are calling. It can identify the closest cell tower but will not be able to pinpoint an exact location. Cell phones may fail you just when you need them most. Depending on the traditional 911 call center in an emergency? You may be contacting an overworked, overwhelmed and understaffed crew. Finding and hiring 911 dispatchers is becoming more and more difficult, according to The Wall Street Journal. It’s a job that has always been a tough one to fill, but the need for emergency operators is becoming an emergency in itself. There are more than 61,000 emergency call centers in the U.S., processing more than 200 million 911 calls each year, according to the National Emergency Number Association. You don’t need to be a wiz to do that math; many 911 dispatch centers are severely understaffed. The tragic result could mean slower response times and unhappy endings. See more in our blog post: 7 Reasons 911 Should Not Be Your First Emergency Phone Call. Having an emergency phone system by the pool gives signals to tenants that you care about their welfare and are being proactive about safety. In addition to drownings and accidents, many tenants use pool phones on-site to report safety and maintenance hazards they encounter at your pool, including leaks and other types of structural damage. Pool repair is expensive and often troublesome. Detecting a maintenance problem early could save you thousands of dollars and even prevent injury or worse. 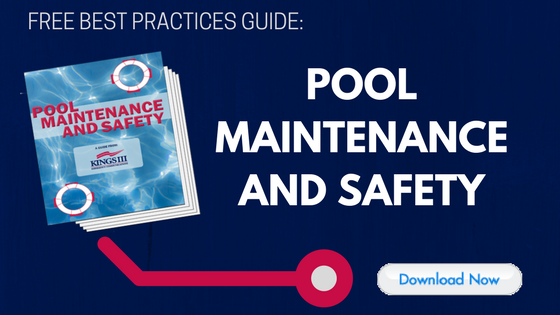 Read more about how to be on the lookout for pool maintenance issues. Drowning injuries aside, pool phones are often used for non-pool related emergencies throughout the year. Our Kings III emergency dispatchers take calls for all kinds of property emergencies placed from pool phones because people often find that these are their only access to help in a time of need. These uses include children who have been locked out of their home, domestic disputes, burglary, auto theft, to report a fire, and a myriad of medical emergencies that can occur. Don’t leave anything to chance. If an incident happens at your pool (or anywhere on-site), one push of a button can start the emergency process immediately. Residents and visitors can simply talk into the emergency phone -- no fumbling with cell phones or looking up emergency contacts. With Kings III Emergency Communications, for instance, live operators are available to help you all day and all year. The line is dedicated and two-way: you never have to worry about dead air. If immediate attention is required, a Kings III operator is there to provide assistance. Our dispatch center is staffed with Advanced Emergency Medical Dispatch certified (AEMD) operators so that they can quickly and expertly provide step-by-step pre-arrival medical instructions (including CPR) as needed. Get more detail about Kings III pool and exterior help phones. Read more about the benefits of having a pool phone specifically in winter or off-season. Emergencies have no off season. You can decrease your risks and liability year-round with Kings III equipment and monitoring at your pool and throughout your property. We give you access to 24/7/365 monitoring, so that any and all emergencies can be dealt with immediately and effectively. Your tenants and staff will have the peace of mind of knowing that they can reach out to a dedicated and trained professional when needed. Say yes to emergency pool phones, required by law or not. Make sure they are tested at least on a monthly basis (check out Kings III auto testing). Contact us so that we can show you how the Kings III Emergency phone systems and monitoring can be your solution to any life-threatening situation that could occur.